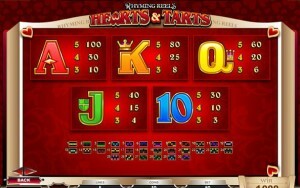 The games from the Rhyming Reels series include this title, called Hearts & Tarts. The theme includes the Queen of Hearts, heart shaped tarts and so on. The series is based on nursery rhymes for the most part, each title being inspired by a different one. It’s an attractive slot machine, with cartoon style symbols and which uses a lot of red, without becoming overwhelming. It’s a game that was designed by Microgaming’s developers. A total of 30 bet lines are arranged on the slot’s 5 reels. Free games, multipliers, scatters and wilds are part of the features, while the biggest prizes are at $2,000. 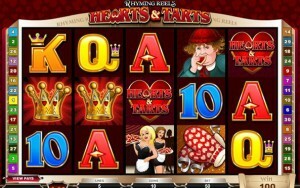 Stacked symbols with the Queen of Hearts are used in the game, and they are especially useful since they offer big prizes. 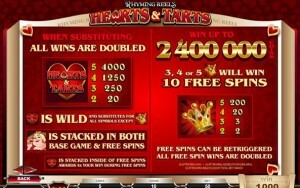 The Hearts & Tarts Logo is used as a wild, while the Crown is the scatter symbol and the one that will bring you the free spins and a multiplier. First, you should know that the Queen symbol is going to show up stacked in the game. It’s not a symbol with a feature attached, it’s a regular one, but it does come in with multiple symbols at a time, and it offers payouts of 1,000x. Since the symbols are stacked, you typically get more than one combo formed during the same round, and the odds are quite low that only one will award a prize. Next, we have the Hearts & Tarts Logo, which the game uses for the role of the wild. It has a 2x multiplier which it applies to wins that are formed with its help. As all wilds do, this symbol is only helpful when it manages to appear in the right place and at the right time. Wilds are also allowed to form combinations, between two and five of them offering prizes when they’re arranged from left to right. 20x to 4,000x the line wager is offered as part of the prize, with the maximum amount being also the top jackpot. The Gold Crown symbol is also very useful when you get it, and the best thing about it is that it doesn’t have to be arranged in a certain way. You simply need 2 or more symbols and in return you will be rewarded with prizes going from 2x to 200x the wager. 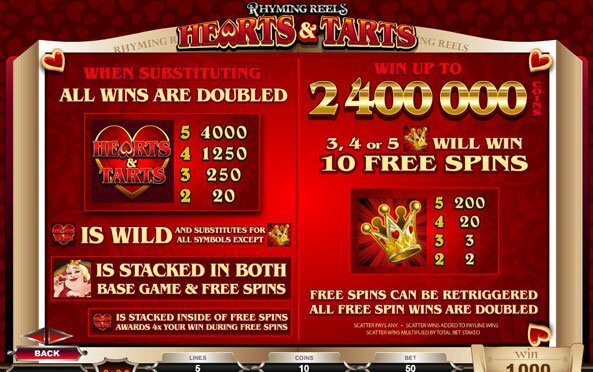 The slot will award free spins whenever 3 to 5 Gold Crowns are scattered around. You get 10 free spins and the multiplier is at 2x. The game keeps the betting at a cheap level, with the maximum being $15. A line bet uses as many as 10 coins, while the denominations are between $0.01 and $0.05. $0.50 is the most you can wager per line. You can get 4,000x the line wager with the right combo, meaning up to $2,000. The stacked Queen symbols can form multiple high paying combinations, each one giving up to 1,000x. 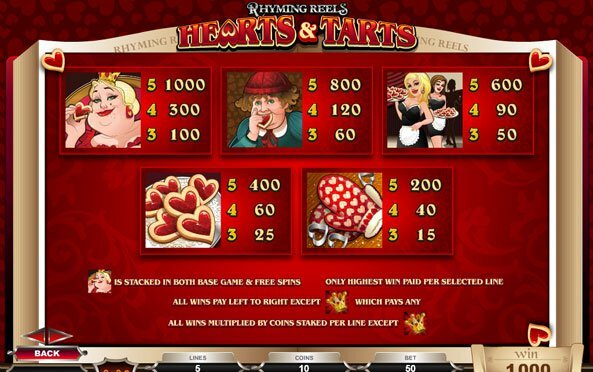 The design of Rhyming Reels Hearts Tarts is the same for all the titles in the series, with a book shaped background placed behind the reels. The images used for the symbols are part playing cards, part images of the characters from the story. A lot of small red hearts and cookies are present in the symbols, even the ones that focus on human characters. Symbols: Game Logo (wild, 4,000x), Gold Crown (200x bet, scatter), Queen (1,000x), Boy (800x), Waitresses (600x), Cookies (400x), Gloves (200x), Ace (100x), King (80x), Queen (60x), Jack (40x) & 10 (30x). All the games from Rhyming Reels can be fun, but the theme isn’t necessarily something that everyone will enjoy. I’m not a fan of the small top payouts either, but at least the features are good. 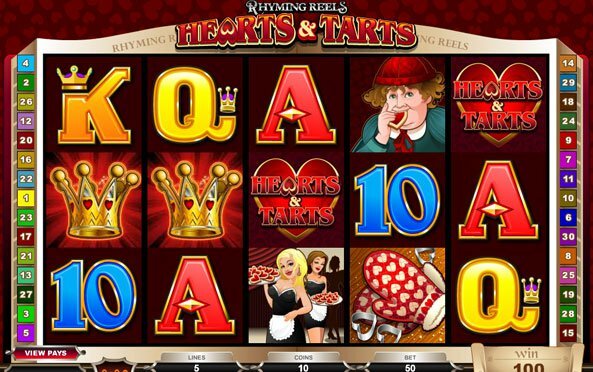 This Rhyming Reels Hearts Tarts slot is offered by all online casinos with Microgaming software, playable either in practice or in real money mode.